As London's blogoshpere bloviates about the unfolding story of that city's Silicon Roundabout, it's easy to overlook the progress others are making to bootstrap technology ecospheres elsewhere in the UK. Leeds is by no means London, Boston or San Francisco, but the one of Britain's emerging city regions is quietly orienting itself to the future by bootstrapping at the grassroots; kickstarting new ventures, firing up coworking spaces, attracting modest VC funds and starting to find its voice. And this is nothing new. In the UK, the first dotcom boom was rooted firmly in Leeds as well as London. Giants such as Freeserve, Ananova and Energis provided large pieces of the consumer and communications infrastructure that delivered the web to people's homes, supported by one of the UK's most vibrant media and academic hubs. 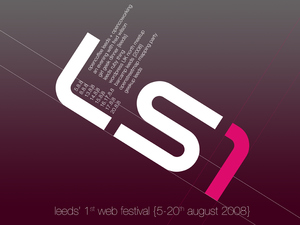 Tommorow marks the start of Leeds' first web festival - LS1 - a bunch of unconferences, keynotes and meetups that almost accidentally landed in the same fifteen day period of August, but which the respective organisers agreed would make for a great platform to show off what the city is contributing to web culture and commerce. All the respective organisers - myself, Linda Broughton, Jeremy Jarvis, Chris Garrett, Tim Waters, Deb Bassett - are hoping you'll visit our city and come away with some new insights and ideas. We really hope you'll drop by. Friendships will be forged, deals struck, ventures launched and ideas transformed into memes. Leeds is not a tech nexus yet - we're a baby hub - but we're building the infrastructure for innovation and invention that'll help us find a place in the future of the web. Leeds also had the first movie ever made, By Louis la prince, over Leeds bridge in 1888.